In the backyard or barnyard, apple cider vinegar can be added to drinking water to improve flock and stock health. It also helps prevent scum buildup inside watering containers. Add one tablespoon of vinegar per gallon of water. Just make sure to use plastic or glass waterers, as the acidity of the apple scrap vinegar will corrode metal. See “The Small Scale Poultry Flock” for more on using ACV with your flock. 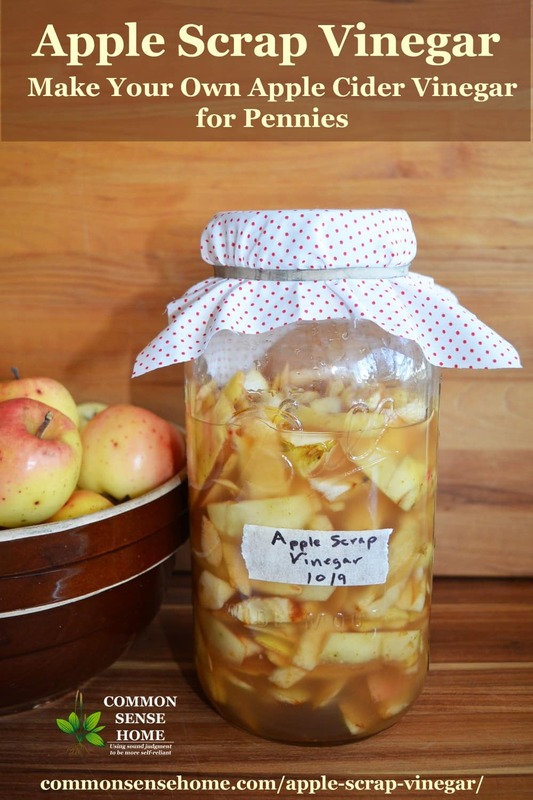 Easy, inexpensive homemade apple Cider vinegar made from apple scraps. Apple scraps, about a quart – you may use cores, peels or even chunks of banged up apples. Just don't use anything rotten or moldy. If you want to make larger batches, just keep the same ratios. Mix sugar in water to dissolve. 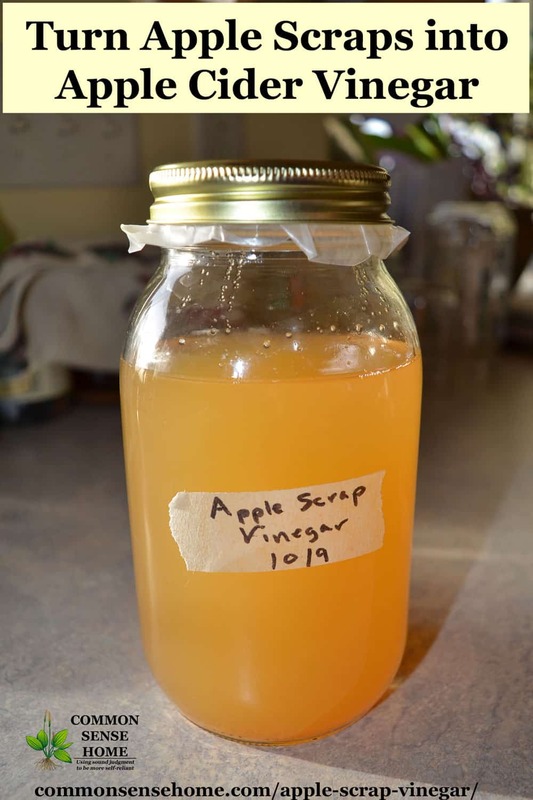 In a 2 quart mason jar or other large, nonreactive container (use glass, food grade plastic or stainless steel) add apple parts and enough sugar water to cover. I like to fill the 2 quart mason jar about half full of apple scraps, then cover with a quart of sugar water. This gives you ample room to mix without spilling, and also allows plenty of room for bubbles formed during fermentation. Add raw apple cider vinegar, if desired. This isn't absolutely needed, but will help jumpstart the ferment. If you have had mold issues in your ferments before, the vinegar is a good safeguard. Stir vigorously and cover opening with a cloth and rubber band to keep out fruit flies but allow natural yeasts in. Initially the smell should start out like apples and hooch (the microbes will produce alcohol before they switch to vinegar), then the sour vinegar smell will develop. Keep jar at room temperature and stir daily for about a week. Strain out apple chunks and compost them (or give them to the chickens). Return to fermenting vessel and ferment for 2-3 more weeks, stirring occasionally. Strain and bottle, use for cooking, cleaning, critters or health, and enjoy your homemade vinegar that only cost you pennies to make. Laurie, will the second straining remove the “mother’ from the vinegar? Straining would remove a solid mass of “mother”, but when the bacteria is live, a new one will generally grow (if your particular yeast species are those that generate a film type mother”. Most of the time (in my experience), vinegar doesn’t form a solid skin of a mother like kombucha, but you will have active cultures throughout the sediment that forms and the brew itself. just use a larger strainer wire… get the big stuff…. Do you just test the ph to know if it is safe to can? Would you put it in clean jars and put the lid on and be done? How exactly would you can? We have 3 bushels and use vinegar all the time so I would love to put som up. It should keep indefinitely in a sealed non-reactive container, without canning. I still have some from last year in good condition. You could even use food grade plastic buckets. I’m not sure how long standard canning lids will hold out without corroding, but you could screw on a layer of wax paper between the lid and the jar to block the acid from the metal lid. You’re welcome. Do make sure when you’re brewing to stir daily when the apple chunks are still in it. The exposed pieces are the most likely spots for a mold outbreak, which will ruin the batch. 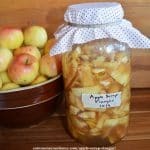 So, if I’m accumulating the apple scraps over the course of a week as we eat apples, how would I store them? Should I just mix everything and add the apples as I go? I’d probably freeze them in a small container until you get enough to make up a batch. That way they won’t start to rot before they ferment. Hi! I just strained my vinegar and put in a container to further ferment for two to three weeks. While now fermenting, do I use cheesecloth on top again? Or a lid? Thank you! I keep the cloth on top while it’s actively fermenting. On one batch I left the apple scraps in for two weeks – what problems might that cause? Due to not reading instruction properly, I used plastic lids instead of cloth covers. I’ve vented and stirred daily. If I switch to cloth cover after removing apple scraps will it get enough yeast? At this point is smells sweet and boozy, which seems right. What do you think? The recipe is pretty forgiving. As long as you’re not seeing mold, you’re probably just fine. There’s generally some naturally occurring yeast on the apples themselves. can I make more vinegar from the mother and how do I do it? You’ll need more apple scraps or juice for another batch. If you have a mother, you can substitute it for the raw apple cider vinegar to provide a culture for your vinegar and speed up the ferment. I will try this for sure, however, I’m wondering if it would be ok to use regular vinegar to start the process? It wouldn’t hurt to add plain vinegar, but the vinegar with mother has the live culture that contains the living bacteria you want that will make the most difference. 1. When collecting scraps, is it ok if the seeds are left inside the cores? 2. Any idea whether the resulting ACV will work well for soap making? I didn’t remove the seeds from the cores. I know there’s some cyanide in the seeds, but as they are not crushed, blended or concentrated, it shouldn’t be an issue. I’ve only made a few batches of homemade soap over the years, so I’m not an expert. I’m guessing there’s a recommended pH level for the vinegar to keep the recipe stable? If so, you could check the pH of your homemade vinegar and see if it’s in range and safe to use. Would well water be okay?